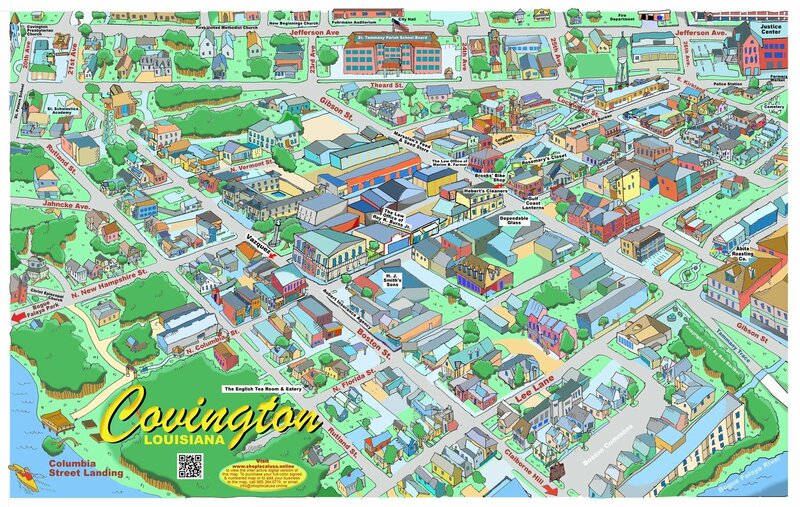 Downtown Covington is a special mix of locally owned shops and businesses. The parish seat, the court house, the school board and many other interesting places are captured in this rendering by local artist Ron Barthet. The extraordinary artistic detail is another great example of Ron's talent as he has created a historical caricature snapshot worthy of being a collector's item. Order your print(s) today and we'll cover the shipping and handling costs if shipped within 50 miles of Covington. Also, quantity pricing for 11" X 17" full color prints is available by calling 985.788.9772. And don't forget to take the "Digital Tour" by visiting www.shoplocalusa.online.